This curb was recently painted red and a sign was installed. Someone removed the sign and painted over the red with gray paint. 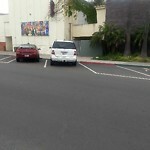 This corner is notorious for illegally parked cars. Red paint for fire hydrant close to 1857 Bluehaven Ct is short. Paint proper red paint. Also, paint red curb for the driveways at the end of the cul-de-sac. 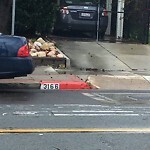 Install red curb at the ramps because cars are blocking. d Collier street we're painted red. Someone painted them gray. 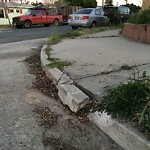 On one corner the weeds covers up the red curb.